Posted on June 25, 2017	by chainsoff. Michael Georgy–U.S.-backed forces are closing in on Islamic State in Raqqa, but local Syrians who have escaped the battlefield are worried about what comes after the fight. Dozens of them have volunteered to help rebuild the town once the militants have been defeated. The aim of organization they have joined, the Raqqa Civil Council (RCC) is to restore order and keep the peace in a place where further violence could fuel the rise of a new set of extremists with global ambitions. The RCC was established in April by Kurdish and Arab allies of the U.S.-led coalition that began attacking Raqqa this month, to replace militant rule in a part of Syria long beyond President Bashar al-Assad‘s control. The campaign against Islamic State has accelerated since President Donald Trump took office in January with the militants now facing defeat in both Raqqa and Mosul in Iraq. But the RCC says post-conflict planning in Raqqa has not kept pace. RCC volunteers say they have told the coalition it will take 5.3 billion Syrian lira (about $10 million) a year to restore power and water supplies, roads and schools and that they have nothing but small private donations so far. The dangers of the failure to rebuild after conflict were clear in Iraq following the 2003 U.S.-led invasion. The post-conflict chaos opened the door to an insurgency that devastated the country and fueled the rise of Islamic State. Mosul and Raqqa are both key centers of the caliphate the group proclaimed in 2014, but Raqqa is its operational headquarters, from where it plotted many of the deadly attacks that have targeted civilians around the world. A U.S. official said Washington stood ready to fund the RCC, “provided they prove themselves inclusive and representative of the communities they govern”. The RCC is a diverse team co-led by Arab tribal leader Sheikh Mahmoud Shawakh al-Bursan, who wears tribal robes, and Kurdish civil engineer Leila Mustafa, dressed in a green shirt and jeans. Based in the village of Ain Issa, 50 km (30 miles) north of Raqqa, it has the support of the Syrian Democratic Forces, U.S.-backed Kurdish and Arab militia fighting Islamic State. “This is a historic step for Raqqa,” Mustafa said, referring to the dozens of technocrats and tribal leaders at its headquarters, a former government water department building, preparing to govern Raqqa until free elections can be held. The lack of funding has left the council, whose 70 members include teachers, doctors, engineers and lawyers, with few resources to appease frustrated, displaced Raqqa residents looking for quick solutions when they return to the city. Revenge killings of anyone associated with Islamic State are likely, and such violence could fuel another extremist militant movement, just as revenge killings of al-Qaeda-linked tribes in Iraq helped Islamic State spread its rule there from Raqqa. Abdul Aziz al-Amir, one of 20 representatives of local tribes on the council, is optimistic they can foster social cohesion in the city, where rows of houses and shops have been pulverized by coalition air strikes and Islamic State bombs. 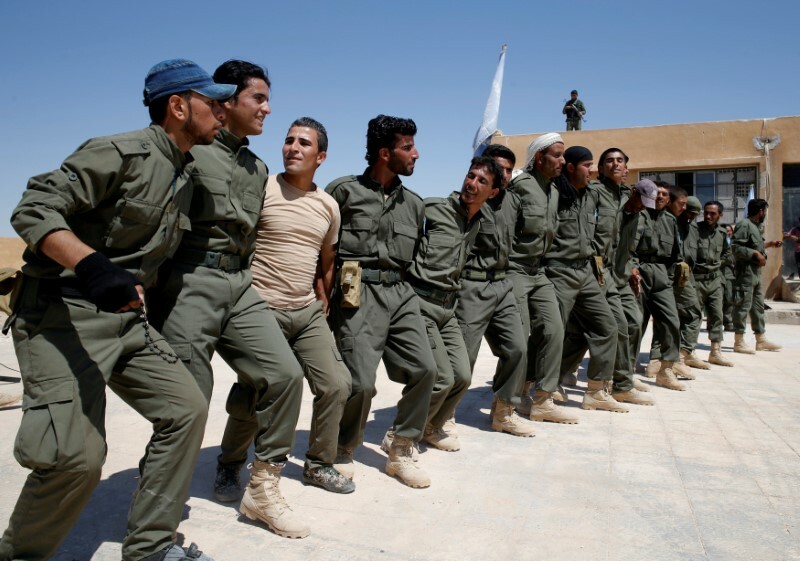 Syria‘s northern neighbor Turkey disagrees, arguing that a Raqqa council allied to Kurdish militia will expand the power of Syria’s Kurds, effective fighters during the six-year-old conflict who have established self-rule in Syria’s north. Turkey has battled a three-decade old insurgency by Kurdish PKK fighters in its south east and says Syrian Kurdish militia are an extension of the outlawed PKK. It views their ascendancy as a security threat. The main Syrian Kurdish groups say their goal is only autonomy in a future democratic and federal Syria. The council says some 80 percent of its members are Arabs, with two Arabs and a Kurd as its deputy leaders. European countries share Turkish and U.S. concerns that the RCC acts independently from the Kurdish militia in Raqqa, an overwhelmingly Arab city, but are very worried about post-conflict limbo given the number of attacks on their soil. “For the moment the United States is telling us, ‘we’re carrying out our war so will see afterwards,” a European diplomat said. The U.S. official said Washington had helped reestablish local governance in other former militant strongholds in Syria and was working with the RCC to ensure it was representative. Sitting in his office surrounded by people asking him to help them return home, he holds up a petition from farmers for funds to fix irrigation canals destroyed by Islamic State. “Fixing Raqqa will require millions and millions of dollars,” said Aloush who had watched as Islamic State destroyed his businesses; a hospital, a sports club, a language school and a restaurant. With 200,000 people displaced from Raqqa and more expected to flee as fighting intensifies, some needs are basic. Two western military personnel from the coalition appeared in Aloush’s office to tell him they could not pay for vehicles to transport food. Aloush told them the council would foot the bill. 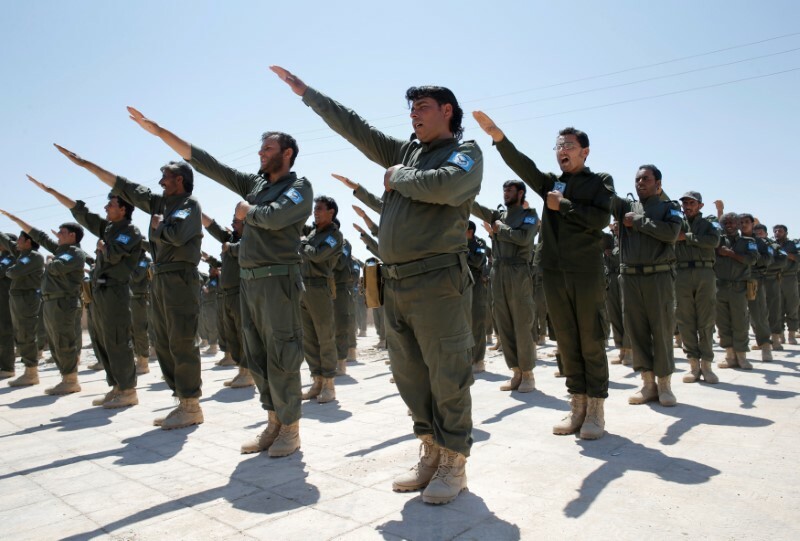 Just outside Ain Issa, police recruits for Raqqa funded by the coalition engage in a traditional dance to celebrate their graduation, after just 12 days of training.Idris Mohamed, a Kurd who has been named as the future head of security in Raqqa, says 700 have been trained so far. “The goal is to train 3,000 but 10,000 would be great,” he said. His main concern, aside from the Islamic State sleeper cells expected to stage attacks once coalition forces have control, is revenge killings that could bring a new wave of instability. As fellow graduates enjoyed the music, young policeman Adel al-Arabi recounted how Islamic State had killed his brother and cousin. “I watched Daesh behead them in the street,” he said, explaining that he had joined the force to avenge their deaths.